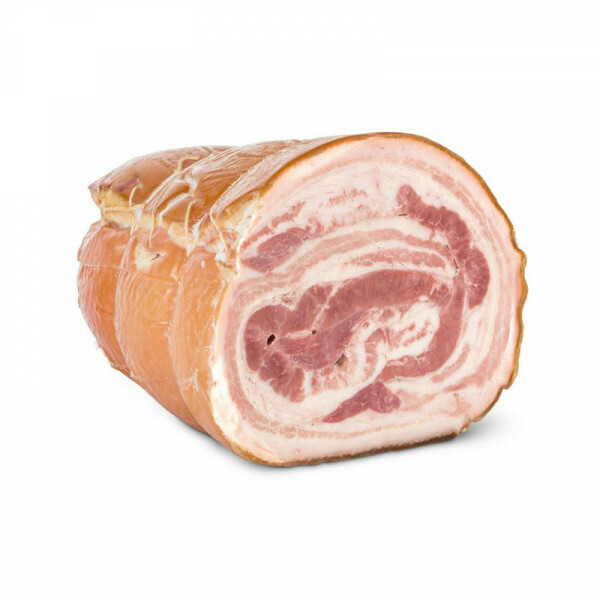 This is a truly specialty: like a cross between Pancetta and cooked ham! They leave the porks' legs in seasoned salt for two weeks, before smoking them for about one hour and finally flavouring them for four days with honey brine. At this point the Pancetta is ready to be combined into a deli meat product, which is then steam cooked for nearly a whole day before spending two hours in a wood oven. Pork - salt - honey 2,4% - natural flavourings - antioxidant: sodium L-ascorbate - preservative: sodium nitrite. It should be enjoyed plain to best appreciates the subtle smokiness, the velvety softness from the honey brine and the delicate crispness from being oven cooked.